Offering you a complete choice of products which include side mounted magnetic level indicator, top mounted magnetic level indicator, top mounted liquid level switch, magnetic level gauge, bicolour type level gauge and folower type level gauge. Backed by rich knowledge, we have been able to satisfy the diverse needs of clients by providing Side Mounted Magnetic Level Indicator. It is mainly under used for most dangerous liquids even with under high pressure & high temperature. 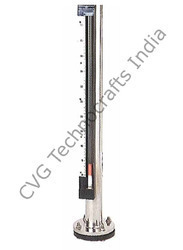 We offer this side mounted magnetic level indicator in diverse modified options according to the customer’s requisites and supply it in given time frame. This side mounted magnetic level indicator is manufactured with top grade of unfinished material, procured from the authentic sources of the market. This side mounted magnetic level indicator is examined on provisions of quality before its final supply to the customers. Main chamber pipe: S.S. / P.P. We are known as the leading manufacturer and supplier of a comprehensive assortment of Top Mounted Magnetic Level Indicator. The offered top mounted magnetic level indicator is offered to the customers in broad quantity after examine on predefined guidelines of the market. Our offered top mounted magnetic level indicator is processed using top quality material & available in various sizes, shapes and model. In addition to this, offered top mounted magnetic level indicator can be availed in various technical stipulations and customized options. Float : S.S. 316 / P.P. Flange : S.S. / M.S. we are leading manufacturer of top mounted liquid level switch. we are leading mnaufacturers of magnetic level gauge. 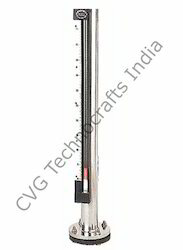 we are leading manufacturers of bicolour type level gauge. we are leading manufacturers of folower type level gauge.